I spent some time tonight playing around with a photograph of Jonathan Fisher’s desk and bookcase. 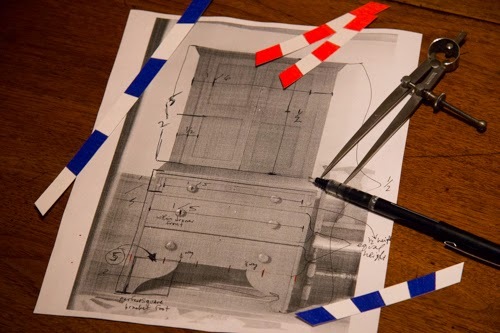 Armed with a pair of dividers and George Walker’s handy instant proportion gauges, I began “smoking out” (as George puts it) the design conception behind this desk. It was a fun excavation sort of process as I plucked the proportions off the image. For those of you not familiar with the use of classical proportions in furniture design, simply put: historically, proportion was not arbitrary. The way each component related to each other was based on simple whole number ratios. 5s and 6s were very common. Looking for these ratios in a piece of extant furniture allows you to stand in the shoes of the maker and envision what he envisioned. Why are the knobs exactly 1/5 of the way in on the drawer fronts? On the bookcase doors, why is the bottom of the middle rail defined by two fifths of the height of the upper case? What are the measurements of those components? Who cares. The designer’s eye is on how the parts relate. Intrigued? I recommend you pick up a copy of Walker and Tolpin’s "By Hand & Eye". I also found George’s DVD "Unlocking the Secrets of Traditional Design" very helpful in this regard. Don’t forget his blog "Design Matters". That’s where I got sucked into this stuff.